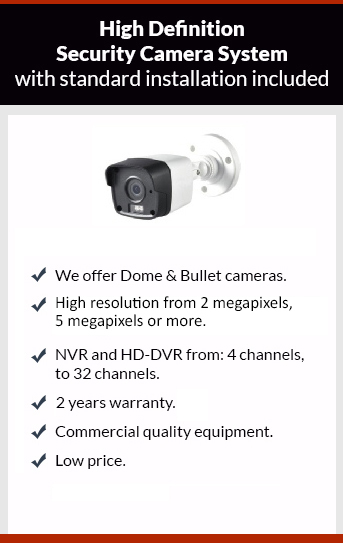 Get affordable Security Camera Installation on Temple City, CA and CCTV equipment with commercial quality and 2 years warranty. It is important to take security seriously, sometimes until something happened is when we take the steps to enforce security. It is not just businesses and commercial properties that need good security but it is our homes too. Security cameras can act as a very successful deterrent to thieves and burglars, and they provide us with video and pictures of the event. The technology behind security equipment has been improved in recent years, at this time you can get HD on 1080p up to 4K of resolution on security camera systems. Our security cameras has a crystal clear picture, and the infrared range goes from 60 feet to 150 feet, with this feature you’ll be sure that you are getting the best system from protection4less. Give us a call to get your appointment, for your free estimate.